The delicate look of small round diamonds surrounding a center cushion cut diamond is sure to be treasured for a lifetime. The thoughtful design allows for a straight wedding band to fit flush against the engagement ring. This gives the opportunity to choice from a wide selection of wedding bands. 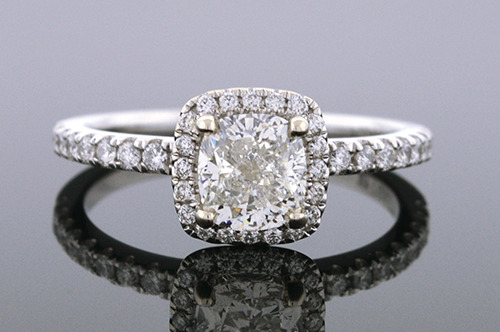 A 1.00 carat cushion cut diamond is the center focus of this ring. This diamond has a color grade of H-I and a clarity grade of SI(1-2). Surrounded by 20 round brilliant cut diamonds while another 18 continue down the shoulders of this beautiful engagement ring. These diamonds have a combined weight of approximately .27 carat total weight. This ring is designed in 14 karat white gold and is currently a size 6.5 and can easily be sized up or down. This ring carries with it a report from the International Gemological Institute with an appraisal value of $9,000.